The Borrowash section stretches from the point where Station Road, Borrowash crosses the canal line to the crossing of the Ockbrook, 400m to the East. It consists of a 300m pound running from Station Road to the east to Borrowash Bottom (or Shacklecross) Lock where the level drops before travelling over the Ockbrook by aqueduct. The map from 1901 shows that an arm went northeast from the lock to a flour and corn mill on the side of the Ockbrook. The mill was part steam powered and part water powered, with a weir (15ft drop) on the brook to form a mill pond. 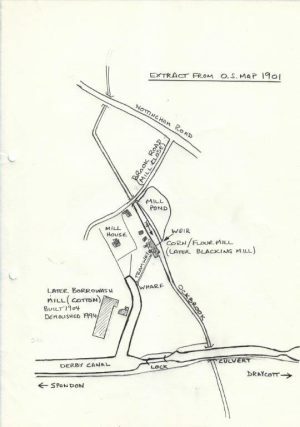 Lead mills were also built around the Mill Pond, and the mill became a Blacking Mill. A stream from above the mill pond came into the end of the canal arm by the Mill House. There was a small wharf and tramway for the mill on the east side of the arm. Later a cotton mill, Borrowash Mill, was added on the west side of the arm. All this has now been buried and the housing estate constructed on the site. 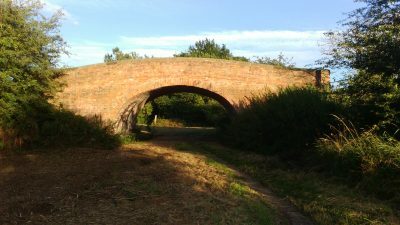 A culvert under the canal carried the Ockbrook down to the Derwent, while the canal carried on across the field towards Draycott. This lock was excavated in 1998 with the help of the local builder, and the stretch of canal from the lock to Station Road was then dug out with the help of the IWA Waterways Recovery Group (WRG) – the national volunteer canal restoration group. The lock walls were partially restored by local volunteers to repair the damage done when the lock was filled in. Following that large sections of the lock wall that comprise the main chamber of the lock were dressed back and rebuilt with new brick. 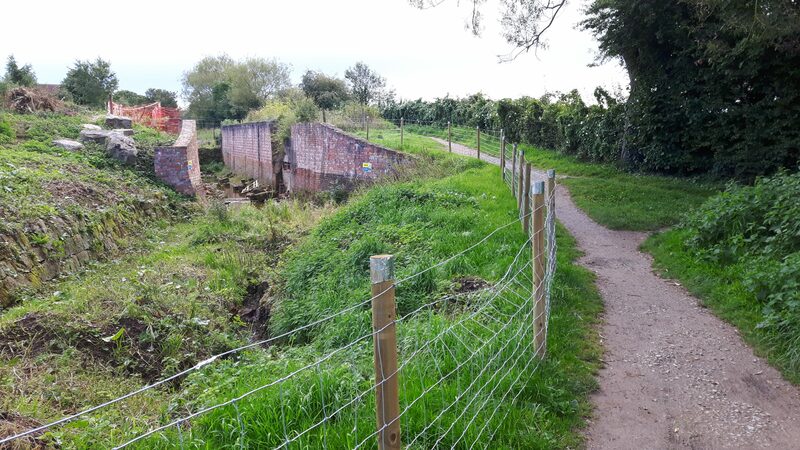 However since then, and until two years ago, the section was largely left untouched such that significant regrowth of trees and deterioration of the lock walls has taken place. The Trust is currently looking to establish a temporary water supply (longer term arrangements exist to abstract from the River Derwent in Pride Park) to enable the full completion of this section. A sewer pipe crosses the canal line half way along and recrosses the line as a large metal surface pipe below the lock chamber. This will need to be relocated underground along the north side of the canal. The immediate plan is to maintain the channel and repair the lock. The channel has become overgrown by many cracked willow trees, most of which have now been felled, but a number of Alders remain along the towpath by Station Road. These are now overhanging the main railway and plans are in place to remove them with the assistance of the Waterways Recovery Group Forestry Division. Sympathetic replacement tree and hedge planting will then take place. In 2015 regular working parties started taking the section in hand. 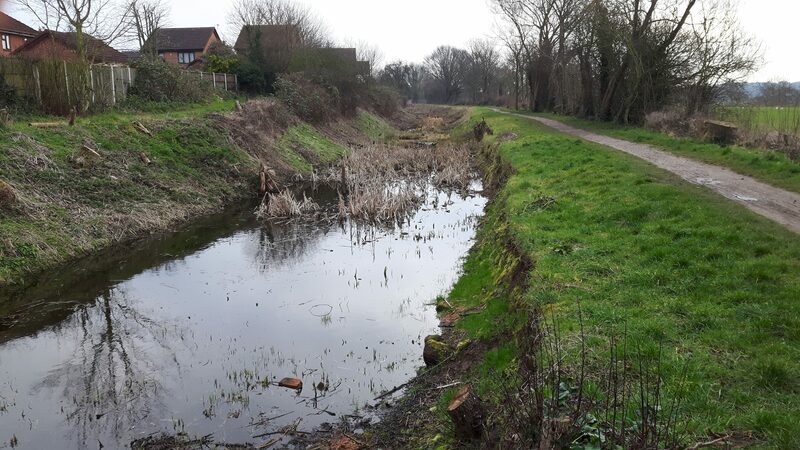 There has been a significant effort put in to cut down and remove the trees such that now there is very definitely a canal line to be seen along the majority of the section. This effort continues with a regular Wednesday working party (see Calendar for details). The focus has also swung onto the lock itself where the lower section of the lower gate opening walls is currently being dressed and re-faced. The lock is partially restored with the wing walls in place. During 2017 new fencing was erected around the lock to ensure visitors could not fall into the chamber. The next stage will be to check the chamber wall bricks to ensure the mortar is intact. Fixings will allow additional brick liners to be attached. Once the walls are restored work can commence on the coping and other stones. When the canal was abandoned the owners bulldozed lock cottages and some coping stones into the lock. When the chamber was excavated a number of large blocks were found lying around the chamber. It will take substantial effort to replace these blocks into position. The blocks have already been numbered and catalogued with dimensions so that we can work out where each stone goes. It is our intention to replace the blocks during 2018 using volunteer labour and heavy lifting equipment. Once the chamber is complete we will turn our attention to fixing the lock gates and bringing back water to the channel. In due course a bridge will be built over the lock chamber to accommodate foot and cycle traffic, which would be prevented from crossing the channel below the lock. The intention is to fill the section so that it can be used for recreational boating while we await further restoration. We breathed a big sigh of relief just before Christmas 2018. For over a year we have grown increasingly concerned that the Alder trees along the canal by Station Road would cause a major train accident. They have always been growing over the fence and the railway line beneath and, given that some of them were starting to rot, we knew we were in danger of one of them collapsing onto the line. We’re pleased that after consulting with Network Rail we have been able to prevent the disaster. We were helped by some professional local tree fellers, who were able to bring them down safely with the help of volunteers from DSCT, who were able to make sure the public were safe and cut up and remove the felled trees. It was a mammoth task for all concerned. This followed the felling of the remaining cracked willow trees on the offbank, which were also leaning over a neighbour’s property. Cracked Willow is not an attractive tree and as its name suggests is liable to cracking and so is also dangerous to anyone underneath. Now that we have removed the main trunks we are able to move on with the second part of the plan. We have acquired around 400 saplings selected by the Woodland Trust and will plant them on the offbank. They will produce a mix of habitats including broadleaf trees and shrubs like hawthorn, holly, etc. Over time these will provide a good amount of cover for wildlife and will merge with the established trees still on the offside, which are both safe and attractive. We’ve even had to politely refuse residents’ requests to take them down. Over the early weeks of 2019, you’ll see a final tidy up on the towpath side and the planting of saplings across the water. We’ll even be using some of the logs to form insect havens to encourage birds, etc. We’re also planning an improvement of the towpath surface itself in the summer so that it is wheelchair friendly. If you are at a loose end why not lend us a hand? It may look a bit barren at the moment, but longer term it will benefit all interests, both walkers, canal enthusiasts and nature lovers. Please feel free to come along to one of our Working Parties in the area, see the Calendar for the latest dates and further details.